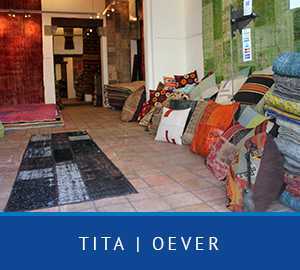 TITA FLYING CARPETS was founded in 2003 in antwerp, kloosterstraat 86. After several succesfull years, we opened a 2nd shop, also in antwerp, at oever 27. Because of the growing success of our products, a 3rd shop was opened in brussels, hoogstraat 209. Further expansion projects are certainly possible in the near future. Our experience and knowledge in the various techniques of patchwork carpets, and the existence of our own workshop in the east of turkey (malatya) allow us to offer our customers the best service possible. We can also offer very competitive prices for wholesale. 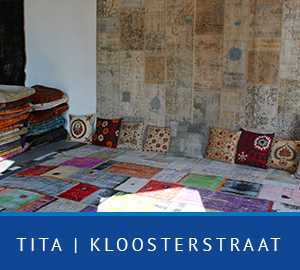 We offer various products, such as PATCHWORK, KELIMS, LANGHARIGE TAPIJTEN, VINTAGE en PILLOWS. These are all handmade products out of turkey. As turkish carpet salesmen, we offer new patchwork designs, made out of old turkish carpets in different sizes and colours. The turkish carpets, both hand knotted and woven, are amongst the best known art forms through out the centuries. The turkish people started years ago in weaving carpets in central asia, and through the years, because of religieus, cultural and historical changes, they became one of the finest in the world. We, as tita flying carpets, want to be a part of this tradition, by collecting old turkish carpets. These pieces are washed and re-coloured with natural colours, and in our own workshop, a new composition is being created. This then results in a new patchwork design. This creates a new trend but continues in maintaining the tradition of the old turkish carpet.